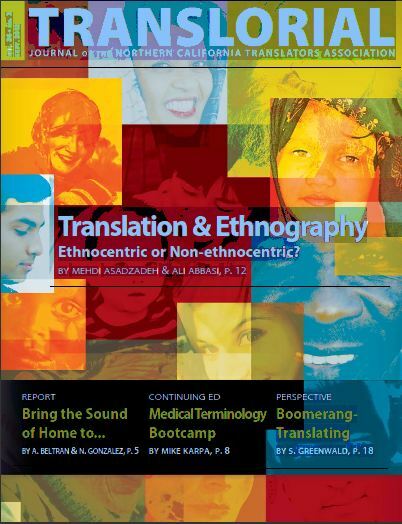 TRANSLATION AND ETHNOGRAPHY: ETHNOCENTRIC OR NON-ETHNOCENTRIC? To an ordinary reader, translation might mean finding “equivalents” for the words of the source text in the target language, thereby making the words of one language understandable in another. But for a translation researcher, it denotes a broader phenomenon where the strangeness has to be found out, decoded and incorporated into the rendered text. In his or her way of doing so, a professional translator uses different strategies, goes through various procedures and seeks help from many other disciplines. In the present paper, the interrelatedness of translation and ethnography is briefly elaborated upon, aiming at stimulating further research on potential areas of interaction and/or cooperation between ethnography and translation studies. The underlying philosophy of ethnography is to make significant thematic or symbolic elements of one culture meaningful in terms of another. The ethnographer’s task could be posited as epitomizing humanism in its desire to provide knowledge about so-called “unknown others”–which translation and translators also pursue. As is well known, the most difficult concepts and words to render are those with roots in culture, necessitating that a translator extract and convey the proper meaning. In that sense, translation could be seen as the area of linguistics that makes sense for the product of ethnography. In fact, the interaction between ethnography and translation studies has created a trend of interdisciplinary research within translation studies where the focus of the discussion lies not only on how translation changes the object, but also on how it reformulates a translated reality. The phenomenon of translation is best dealt with by taking account of knowledge about the unknown others’ ways of thinking, knowing and living–all central issues in ethnography. The basic principle of ethnography is in fact a translation, but in the sense of showing how a social action from one point of view makes sense from another. This is what a professional translator does by trying to convey the points in a way that is tangible, understandable and digestible to target readers. In translation studies, there is always a concern that cultural codes of a community might be misunderstood or misinterpreted by target readers because of mistranslation or lack of sufficient cultural knowledge of both languages in the mediator agent, i.e., translator. This concern is also found in ethnography in its emphasis on cultural codes to be decoded and conveyed correctly, duly and properly; that is, to understand and transfer the intention of the concept as well as the proper wish of the writer. The ethnographic perspective toward translation invites us to regard it as a production process that relies on networks of intermediaries. A translated text is thus no longer assumed to be a reflection of a society’s norms or a translator’s subjectivity, but rather as expression of the relations between various intermediaries in the production procedure. Cultural codes could be adapted to the receiving culture partly because there might not be equivalents in the target culture. Pálsson (1993) presents this idea of translation as a means of bridging the gap between cultural boundaries by referring to it as “discovering order in the foreign.” This suggests that seeing the world as bound up is an ethnocentric way of looking at culture. Pálsson argues that perceiving difference between cultures as boundaries presents the world as multiple worlds, rather than just one. Two important concepts that must be considered here are ethnocentric and non-ethnocentric translation. An ethnocentric translation is one that “generally under the guise of transmissibility, [it] carries out a systematic negation of the strangeness of the foreign work” (Berman, 1992: 5). An acceptable translation tries to limit ethnocentric negation by staging “an opening, a dialogue, a cross-breeding, and a decentering,” thereby forcing the domestic language and culture to register the foreignness of the foreign text. A work of translation should try to consider the interests of all cultural groups of a society rather than only the dominant one(s). While paying due attention to the originating culture of the texts, a translation project should address various domestic constituencies. By doing an ethnocentric translation, the fact of translation is erased by suppressing the linguistic and cultural differences of the foreign text, assimilating it to dominant values in the target-language culture, making it recognizable, and therefore seemingly untranslated. By non-ethnocentric, a kind of translation is meant in which there is an ideal balance between domesticating and foreignizing processes and thus, while respecting all cultural codes of the receiving society, the foreign culture is also duly maintained. A non-ethnocentric translation has the capacity to alter the reproduction of only dominant domestic ideologies that do not correctly and properly represent foreign culture, and also marginalize domestic constituencies other than dominant one(s). It fosters non-academic intentions from flowing into academic realms by trying to persuade and also to offer practical methods for faithful translation to translators so as not to demolish the text by over-domestication or over-foreignization. It stimulates the translator to side neither with source nor with target context and to try to follow a medial manner when rendering. In this way, his/her translation reveals an opportunity to reform the cultural identities that occupy dominant positions in the receiving society. It of course needs mentioning that a too non-ethnocentric translation would be subversive of domestic ideologies and institutions. After all, trying just to reflect foreign culture at any price without respecting the domestic one would definitely lead to unintelligibility and, in certain cases, to cultural marginality. Nevertheless, provided that the balance is observed, non-ethnocentric translation is suggested in that it promises greater openness to cultural differences. 1. A term used in postcolonial studies to indicate the discourses that surround colonized people. Also, a mode of thinking that leads to people being regarded as different and inferior. A key element in the work of Foucault on those excluded from power, including prisoners, gay persons and the mentally ill.
2. See Berman, Antoine. The experience of the foreign: Culture and translation in romantic Germany. New York: State University of New York Press, 1992. Print. 3. See St-Pierre, Paul, and Prafulla C. Kar, eds. In Translation-Reflections, Refractions, Transformations. Amsterdam: John Benjamins, 2007: 40. Print. mimi posted this article under Perspective, Translation	on Saturday, September 1st, 2012 at 12:10 pm	You can follow any responses to this entry through the RSS 2.0 feed. Both comments and pings are currently closed.